When the new arc bricks were unleashed upon fontstructland, I attempted several different styles incorporating this new maximum curve. My first drafts revealed the direction I was heading. I wanted to create a flawless geometric, technical sans lowercase with a touch of calligraphic flair (there are some optical correction issues in the result, e.g. with the e). For the uppercase, I intended maximum style without sacrificing too much coherence – why lose any of the best bits? Brush script, art deco, classic engraving, three genera of gothic (sans serif, blackletter, and ancient alphabet! ), runic, hieroglyphic, and yet still some futuristic tendencies all informed me. But do they blend? Info: Created on 28th August 2010 . Last edited on 18th September 2012. Very cool. I'm lovin the '@' and '&', plus most of the lower case, and a few gems in the upper....especially the A. That Q is the embodiment of feminism womanhood. Could an alt. Q be introduced to incorporate the man as well? Innovation being your long-standing hallmark, you delight us yet again, (as elmoyenique would say:) master. Thank you. Very nice work will.i this is strong work. Bravo! @thalamic: I love the suggestion. While the standard rendition of the ‘mars’ glyph points up – awkward for a Q – this won’t stop me from adapting it. After the judging period wraps up for the handmade competition, I’ll add this and a fine new sample. Cheers! @djnippa: Thanks, friend. The @ will definitely find a home in the next graphic. I’ll tell you, with great difficulty I choose A over @ in Archly above. What I like most of your fontstructions is that they don't look at all like made with bricks, and yet by analyzing them you can still understand the bricks beneath the complex shapes and smooth curves (real curves, not fake-beziers that are so tiresome to the eye...). @Emilio: Thank you for your generous and astute words, describing very well what I try to achieve here. It’s an even greater compliment coming from you, whom I consider to have one of the most sophisticated and refined design acumen amongst longtime fontstruct contributors. Your excellent and fully realized works teach me by example to remember (and try to practice!) how restraint can be the most effective design tool we have. Congratulations! FontStruct Staff have deemed your FontStruction worthy of special mention. 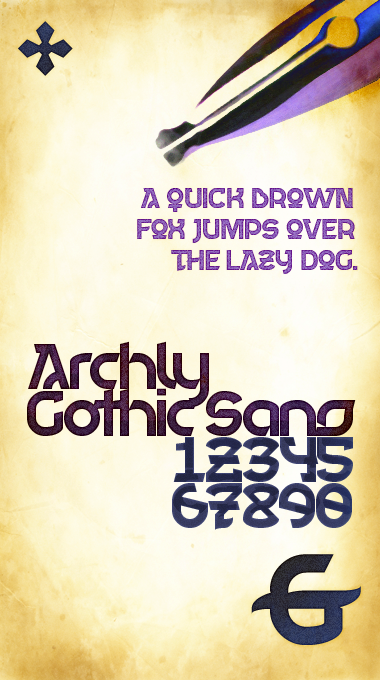 “Archly Gothic Sans” is now a Top Pick.